Your blog about the “Deep State” being nothing more than the bureaucracy made me laugh. If memory serves, didn’t some of the Chinese dynasties implode because of bureaucracies? Or am I being nearsighted and all governments typically implode because of bureaucracies? On a fractal level, don’t all corporations implode because of their bureaucracies over time? Working in the medical field, the rank and file have a very high distaste for the epitome of the bureaucrats, the hospital administrators. One of the pitfalls of the bureaucracy is there is NO feedback loop. They make the rules but do not have to live them. I found that bitching doesn’t make them change their rules but a strategically timed call at 2-3 am to discuss the shortcomings of their boneheaded decisions typically does. So how do we, joe public, call the government bureaucrats at 2 am in the morning? Voting for Britexit? Trump? Will they listen? Keep up the good work and hope to finally meet you in Nov.
1) The first thing you do is assign blame. Do not fix the problem, but make sure that blame is assigned. Remember if you fix the problem, your job is at risk. 3) Vote/assign yourself salary raises and as many perks as you can get. Perhaps you and the readership of your blog can finish out the list. REPLY: Corporations also fail when the board replaces the creators, abandon imagination, and proceed to comply with all the rules so they are run by the lawyers and accountants. I have found it very frustrating getting called in when they have a crisis that they create by mismanagement. The profit margins have to expand to cover the costs of waste by mismanagement. 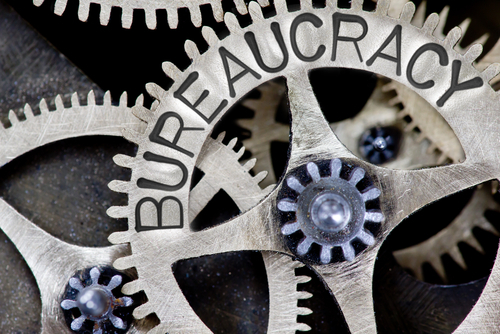 The Deep State is indeed the bureaucracy. Just look at Brussels. They are waging a fight against anything that would undermine the euro, not to further the living standards or expand the economy of Europe. It has now turned all around and the primary goal is to preserve the EU bureaucracy. They now are defending their jobs. People think there is some global conspiracy. These people cannot even run their own state no less agree to hand power to yet some other mythical super group lurking behind the curtain. I have been called in to probably more central banks than anyone. The ONLY reason I am called in is because they UNDERSTAND we are INDEPENDENT and our computer is not biased. They want real live forecasts, not politically correct forecasts they pay to publish as propaganda. If they were 100% in absolute command, they would NEVER call us in to begin with.